Student-Built Biofuel Truck Breaks World's Land Speed Record at 155 MPH! Boise University’s Greenspeed pick-up truck has just broken the world’s biofuel land speed record — all while running solely on vegetable oil! The green powerhouse reached a whopping 155 miles per hour, making history at the El Mirage Dry Lake in Southern California. Headed by Dave Schenker, the student team converted a 1998 Chevrolet S-10 into a supreme vegetable oil guzzling road machine. Inspired by Rudolph Diesel’s plan to run farm equipment on fuel farmers could grow, Schenker sought to do the same with personal utility vehicles. Having the resources as a student at Boise State, he formulated the winning Greenspeed team and set out to break the speed record. To achieve the speed record, the team could not make many aerodynamic alterations to the vehicle’s exterior — in the end it had to still embody the aesthetic of the S-10 pick–up truck that it started out to be. In a 2.5 month time crunch, the vehicle was converted to have a compound-turbocharged 5.9 liter Cummins straight-six diesel engine that produced 700 horsepower, and ran on a oil mix consisting of cottonseed and sunflower oil. 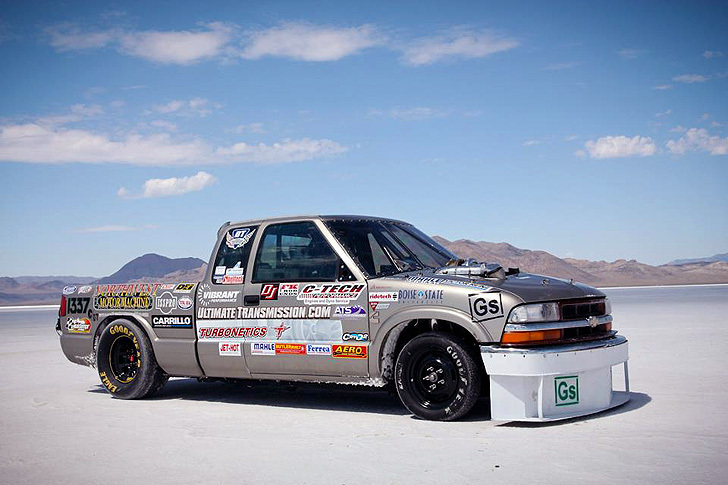 With donations from over 70 sponsors supporting the engineering undertaking, the truck was able to reach 137 mph at Bonneville Speed Week before its run at El Mirage. The team plans to amp it up next time, shooting for 215 mph. And next time they’ll replace the cottonseed/sunflower oil blend with an even higher performing edible oil: canola oil. Boise University’s Greenspeed pick-up truck has just broken the world's biofuel land speed record -- all while running solely on vegetable oil! The green powerhouse reached a whopping 155 miles per hour, making history at the El Mirage Dry Lake in Southern California. Headed by Dave Schenker, the student team converted a 1998 Chevrolet S-10 into a supreme vegetable oil guzzling road machine.